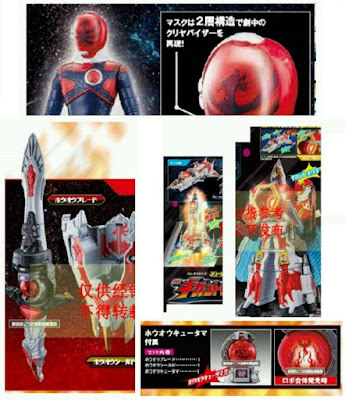 Uchuu Sentai Kyurange - 12th Ranger, Movie Voyager Machine, New Kyutama & An All New Shishi Red Exclusive Form! 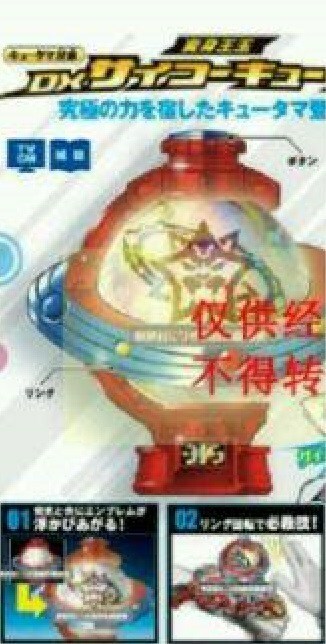 A new bunch of leaked images from the still unreleased Uchuu Sentai Kyuranger 3rd quarter toy catalog has surfaced giving us our first look at the 12th Kyuranger, the movie Voyager machine, a new kyutama and Shishi Red's all new power-up! First image gives us HoOh Soldier, the 12th Kyuranger, a warrior from the phoenix constellation. While his identity is soon to be revealed, he transforms using the Phoenix Kyutama and he is armed with the HoOh Sword and HoOh Shield. His personal Voyager Machine is the Phoenix Voyager which can also transform into the Gigant HoOh. Up next is the summer movie mecha called the Cerberus Voyager. And as usual, this is just a repaint of the Lion Voyager just like last year's Zyuoh Condor from the Zyuohger movie but with a different head. Then we have the Saikyo (great) Kyutama which is much bigger than the regular Kyutama we have already known and is said to be the most powerful kyutama there is. And finally, here's our brief and blurry look at Shishi Red's upcoming super form, Shishi Red Orion. Could this be the form that the Saikyo Kyutama will unleash? Another f-ing red exclusive power up. Don't be surprised if Phoenix is another form for Lucky. Man's graduated from Daigo and Right's school of jackass protagonism. SMH Toei just doesn't learn do they? Shishi red has 4 power ups, FOUR! I really hope they can share power ups. Sentai is trying to hard to focus on red to a point where they keep on forgetting other characters. Even if Lucky gets this power up, why not let the other power up forms debut go to other characters? He looks good but I just find toei is Trying to make sentai into kamen rider which is infuriating. This show just keeps on fixating on power ups. As for Ho-oh soldier, Until I could get a much clearer picture in better quality, I'll voice my opinion but as of now he looks sort of okay, I think they could pf make the phoenix visor cooler on his helmet but like said clearer image. What if they have, only that they have learnt that giving the whole team the power-up is a waste of money as compared to only one? 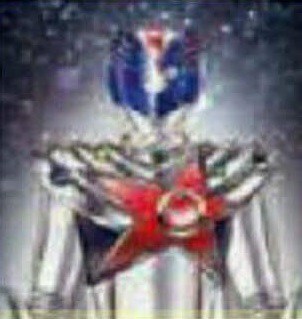 At least Lucky is the "white" ranger now and HoOh Soldier is the red. They need the Biggest Constellation: Hydra for the Final Mech! "Could this be the form Saikyo Kyutama will unleash?" Um, judging by the color scheme its pretty obvious. @3rd anon, you couldn't be any more on the money with that second observation. So far the show has basically been, "The Magnificent Adventures of Lucky, and some other guys". Hell, even Kamen Rider tends to be generous about giving other Riders power ups. Kyuranger is starting to disappoint me. It has vast potential, but Toei's addiction of making Red the only protagonist is tiring ever since Kyoryuger. I don't want to rage quit this show like I did with Zyuohger. The thing with Zyuohger is that Yamato is, at least, likeable. Lucky, much like other stupid douches such as Daigo, Right and Takaharu, is annoying and is shoved in the viewers faces not because he has something special, but because they want the red one to be the coolest. That is pure marketing instead of character development. @anon3 Phoenix ins't a Lucky form Dumass! Ho Oh Soldier kind of reminds me of KR Ghost Toucon Boost. "Kyuranger is starting to disappoint me"
They keep doing this (exclusive red power up) simply because it gives them MORE benefit. They are a big company and not stupid ones. they must be have their own data if they are confident enough to give Red Exclusive form from season to season.